Symbols of different types of fruit have been popular features of poker machines since the first mechanical devices were introduced over 100 years ago. There’s a good reason for this, as originally the technology to pay out cash wasn’t perfected and was illegal anyway, so players won fruit-flavoured sweets or gum instead and the symbols were developed to reflect this. So now you know. 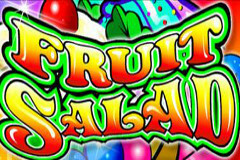 Microgaming have a whole series of fruit-based games, with Fruit Salad being a classic example of a 3-reel, 3-payine one that mixes all of them up into a tasty-looking salad. Although these games are all pretty basic, here we at least have a wild symbol to help complete winning lines, while the jackpot of 5,000 coins serves up a tasty treat of its own. Just like the snack it’s based on, Fruit Salad is filled with colour, with a rainbow effect making the background bright and cheerful, while the symbols themselves are equally eye-catching. A vividly designed game logo, surrounded by the various ingredients of the salad sits below the reels and to the right of the game, there’s a payout table which informs the players about what rewards they can expect to receive when different winning combinations land in the right spots. Below it all, we see the standard Microgaming control buttons, where players can set the amount wagered. The value of a coin can be adjusted up or down and be anything from 0.25 to 5.00, while there’s also the choice of playing with 1 coin to activate just a single payline, 2 coins, or with the maximum of 3 coins, all 3 lines are in play. By having all coins active, it ensures that all winning combinations that appear on the reels are claimed, while also qualifying players for an enhanced jackpot payout when the right symbols land in place, so it’s worth placing even just the minimum coin size on each line for a 0.75 stake, rather than have a higher coin value but just on 1 or 2 lines. At the maximum stake of 15.00. it’s still a game designed for low to medium level players, with those wanting to place bigger bets probably being a little disappointed by this. The paytable is a fairly simple affair, as there are not many different types of symbols. Any combination of bar symbols will result in a win equal to 7 coins, while the single bar landing across a line on its own will be worth 15 coins. If the double bar symbol fills a line, then the prize will be 30 coins, and for the triple bar it’s 80 coins. There a couple of fruit-based symbols at the top of the table, each of which is worth substantially more than the bars, with a peeling orange being worth 150 coins, and a tropical pear having a value of 300. That’s it for the regular symbols, and all that’s left is the fruit salad bowl itself. It acts as a wild symbol, so if 1 or 2 examples of any other symbol plus 1 or 2 wilds land on a line it will still count for a win. Along with this, the fruit bowl has the highest value of all, with a win of 1500x when it lands across the 1st payline along the centre of the reels and should it fill the 2nd line along the top, players will pick up a win of 3000x. The jackpot is paid when it lands on the 3rd payline along the bottom, which is only active if all 3 coins are in play, and with a prize value of 5000 coins, players could have their bankrolls boosted by 25,000.00 if they are playing the maximum amount. A Bowl Lot of Fun? Fruit Salad is quite old-fashioned, with no bonus rounds, or multiplier prizes for players to pick up, but it’s easy to play and looks quite appealing as well. Those who like pub-style games that involve little more than spinning the reels and collecting any wins will appreciate the gameplay of Fruit Salad and it’s pretty easy to spin up some wins across the 3 lines. Maybe wild multipliers would have been nice, and that 15.00 maximum stake is low, but when a game is as colourful and easy to play as this, why complain about a coupe of details?